Nearly all New Zealand’s current electric vehicle and plug-in hybrid owners are likely to consider buying another EV or PHEV – particularly when more models become available that can travel further, have better off-road capability and carry heavier loads. There is general optimism as the market continues to grow that prices will decrease, and technology will improve in the near future. Our fifteenth 1-click survey proposed that “If I buy another car, it will be an electric (EV) or plug-in hybrid vehicle (PHEV)”. The poll was sent on 10 January 2018 to 473 Electric Vehicle (EV) owners and 41 Plug-in Hybrid (PHEV, including Range Extenders) owners who have enrolled in the Flip the Fleet project • 254 EV and 22 PHEV owners responded by 19 December • A total of 138 respondents provided 196 reasons for their choice, with EV owners providing most of the comments (93%). 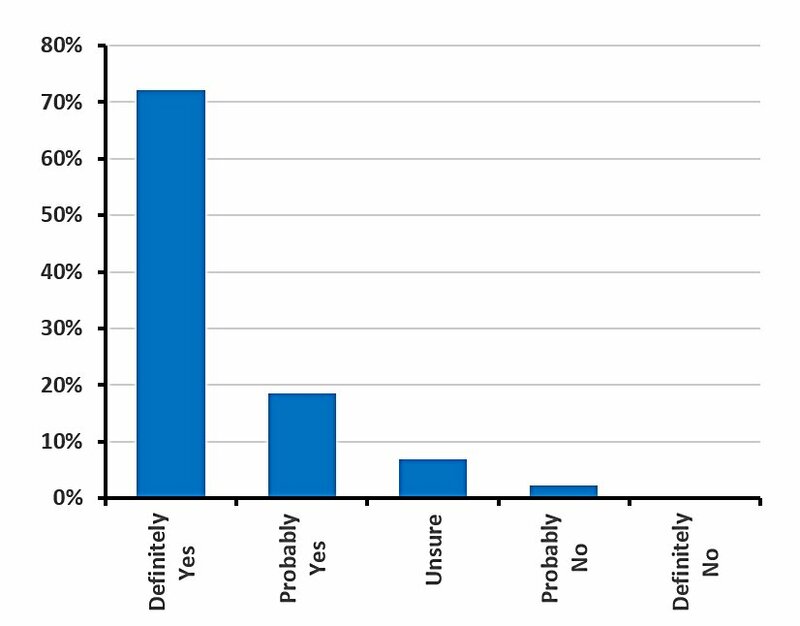 Fig.1 Responses of EV or PHEV/REX owners to the proposition that “If I buy another car, it will be an electric or plug-in hybrid vehicle” (n=276 responses). Most (91%) current EV and PHEV owners (Fig. 1) would either definitely, or probably purchase another EV or PHEV if needed. Of the remainder 7% were unsure, and only a small minority (2%) were probably not going to purchase another EV or PHEV. Only 1 survey respondent (0.4% – note other numbers have been rounded) was definitely not likely to purchase an EV or PHEV as another vehicle. Six broad themes were identified from 1-click Survey #15 responses. The category of “Other” has not been included in Table 1. It includes new owners who have not yet had an opportunity to fully assess their vehicle’s functionality and miscellaneous comments. Very lengthy comments were split into multiple themes. Benefits to the environment and sustainability were identified by 15% of respondents as a reason for definitely, or probably purchasing an EV/PHEV as another vehicle. The benefits encompass caring for the planet for future generations along with improving human health and wellbeing. 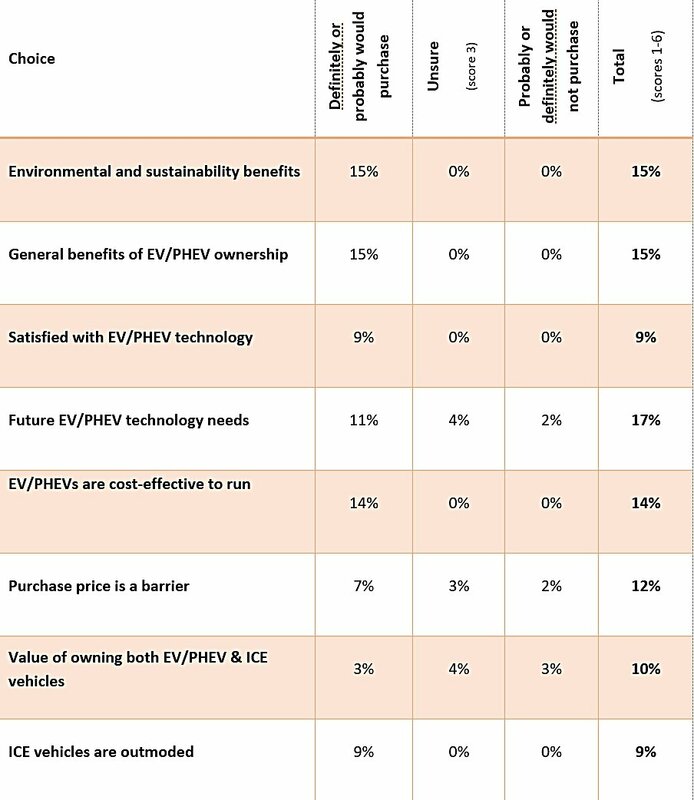 This group (15%) also identified a wide range of general benefits to EV/PHEV ownership, such as the greater enjoyment of driving when compared with driving petrol or diesel only cars. Just over one-quarter of respondents (26%) specifically mentioned technology. Respondents satisfied with the current technology (9%) that make EV/PHEV ownership more attractive to new buyers highlighted the rapid development of the fast charger network and reduced maintenance requirements. Future technology needs (17%) included longer range, heavy haulage/special purpose (e.g., farm and off-road) and the ability to ‘re-battery’ (i.e. extend battery life). Cost and affordability (26%) was also mentioned by just over one quarter of respondents. A specific benefit of EV/PHEV ownership was highlighted as their cost-effectiveness to run (14% of respondents). However, the higher up-front purchase price was a barrier for 12% of respondents and for 2% of respondents was a major deciding factor for not purchasing. Some respondents (3%) emphasised the value of owning both EV/PHEV and ICE vehicles to complement each other. Some EV/PHEV owners (9%) expressed their general distaste for ICE vehicles, seeing them as backward, though were resigned to using them until better EV/PHEV alternatives are available. Overall, respondents who would probably or definitely not purchase an EV/PHEV provided 7% of comments in these categories. Most focussed on technological barriers (e.g., shorter range and limited battery life) and/or affordability as deciding factors. Several respondents currently owning ICE vehicles opted to retain them until EV/PHEV options more suited to their needs were available (e.g., could tow heavy loads, travel long distances and off road). A few at this stage would replace their old ICE with a newer ICE. Table 1. 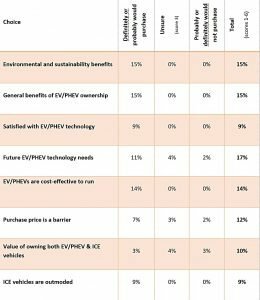 Themes in comments by 128 EV and 10 PHEV owners in response to the proposition that “If I buy another car, it will be an electric or plug-in hybrid vehicle”. The table excludes comments on miscellaneous themes. Our question is a real test of the utility of EVs and the pleasure they give owners. The results show that EV and PHEVs are overwhelmingly happy with their choice of vehicle and the majority (91%) would choose an EV or PHEV again if they buy another car. Many existing EV/PHEV owners most likely to purchase another vehicle of this type, see themselves as having a moral duty both to safeguard the future of the planet through reducing emissions and for society: “We all need to do our bit to drastically reduce our reliance on oil and the grief & damage this causes”. Environmental and sustainability themes are strong among this group, with many enriching their comments by highlighting the benefits (e.g., technological, overall driver experience, running cost) to owning vehicles of this type. A typical example is: “We are more than happy with the performance, running costs and convenience – and frankly, sheer fun – of driving an electric vehicle. And the environmental imperative of drastically reducing fossil fuel emissions means that there is, to our knowledge, no acceptable alternative for a private vehicle.” For others, the shift to an EV (more so than a PHEV), is part of a larger change, both in lifestyle and mindset, for example, slowing down and deriving greater enjoyment from travel. Constraints of EV ownership are reducing and opportunities increasing because of enhanced technology, better power supply, improved charging infrastructure that are being driven by increased consumer demand. The general tone of comments on this theme suggests confidence that these changes would occur rapidly – within 5 years, and that prices would drop accordingly. Existing technology was obviously attractive to EV/PHEV owners though potential buyers require further information on which base purchasing: “Very interested and just awaiting more options… need to know how well the different manufacturers have adopted and made their EV tech”. For several respondents, a rapid drop in the resale value of existing EV/PHEVs vehicles raised some concern among early adopters, but pleasing others that want to see the initial capital outlay to reduce enough to get lots more New Zealanders buying EVs. The reduced costs of run an EV/PHEV was frequently mentioned as was the cost of purchasing new vehicles when compared with purchasing a new/second-hand ICE vehicle. One respondent felt annoyed at the continued focus on purchase costs: “How many people are there out there driving big cars that cost the same as an EV? Anyway, it’s not about short-term cost, it’s about long-term cost”. For a few others, changes need to occur in the current market: “The only obstacle is the cost price, and as long as second-hand imports or subsidized vehicles are available, then it is an excellent choice”. A shift in mindset between short-term and long-term outlay was highlighted with one respondent stating: “It’s even worth borrowing money to fund the difference in price between EV and non-EV, as the money saved on fuel will more than cover the interest on the loan”. For one respondent, costs savings were calculated in the following way: “the annual money saved on fossil fuel and other running costs will more than cover any requirement for flying and/or hiring a vehicle for the 1-2 times a year that we need to go on long distance road trips”. Owners of both an EV/PHEV and an ICEs exploit their separate functionality: the EV or PHEV was generally used for shorter distance travel (e.g., for commuting to work and day-to-day driving), while the second (or third) ICE vehicle was used for longer distance travel, the capacity to tow trailers/ caravans and carry more people, or for specialised off-road use requiring 4WD capacity. To consider purchasing an EV or PHEV as a second (or third) vehicle, owners expressed a need for a vehicle with comparable functionality to their current ICE. At present, there are limited models available for these uses (e.g., electric utes), and if models are available, then the cost of purchasing is a major deciding factor – and consequent barrier. EV owners provided most of the comments, with several respondents critiquing PHEVs, e.g., for being “…a compromise that achieves the worst of both worlds” as well as “…excessively complicated and not very efficient”. However, for one respondent, a PHEV would meet needs better than an EV: “My travel is about the journey and the destination, not about the car, which has to be a timely, reliable long-term, and cost-efficient tool for the job, available at a moment’s notice, doing its work entirely in the background. EVs don’t meet any of my criteria…” For a few others, purchasing a newer ICE vehicle still represented the best option for their lifestyle, current state of technology and power supply infrastructure: “We are moving to the country and the lack of range of an EV will become even more of a problem. It is likely that we would buy a small diesel car with good fuel economy and range instead”. As early adopters, some EV/PHEV owners were openly critical of ICE vehicles: “…create a lot of waste – exhaust, heat and noise for minimal gain. Its fuel is energy and pollution intensive and ultimately limited in availability” highlighting that newer technologies offer many more benefits both to society and the environment. Below is a lightly edited and re-arranged record of all the comments received. EVs are just… no brainers!